Free, a self-described pan-European skate mag, has resurrected a classic concept this week: invite five teams to share one house in the gorgeous French countryside and pump out an edit apiece. 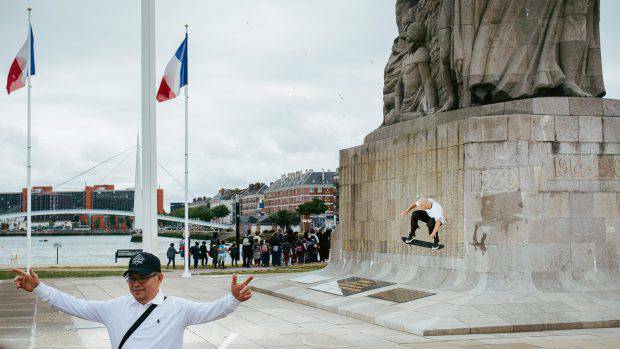 “The Battle of Normandy” is the cheekily named series (previously executed by several French skate mags, most recently in 2011), and it doesn’t deliver a “battle” as much as a dance party—one in which everyone is dancing in different corners of a city, yet rhythmically in sync. The five teams in question—which released a video each day this week—are at the forefront of the European skate scene: Sour, with its unique approach to spots and signature humor; Antiz, an OG French company (now over 16 years old); the always energetic Palace, which is impossible to categorize with its outsized crossover influence; Magenta, a pioneer of a particular style of rapid-fire urban exploration (at all hours of the night) that has caught on like wildfire in the past few years; and today’s entry, Element Europe, featuring world-class pluviophile Phil Zwijsen. Wow, talk about “now n’ later”: Lotti’s “Respect Your Roots” release is a classy reissue of the shoes he used to skate in his early career.